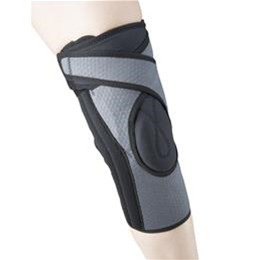 The OTC Select 2550 knee support is made from Airmesh fabric, a strong yet lightweight non-latex open knit material. Airmesh offers breathability, elasticity, compression and comfort. It is well suited for long-term wear, wear in warmer climates and ideal for those who are allergic to or irritated by neoprene fabric.